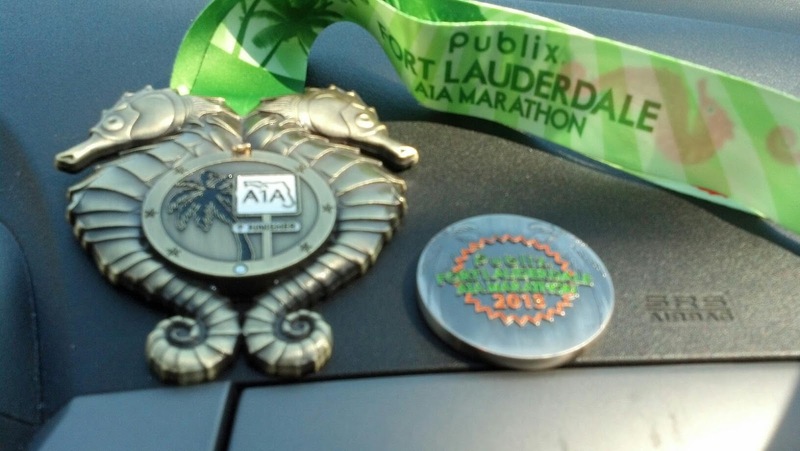 Before I get to my disappointing A1A race report, I thought I would start with a quick report from a local race I did the week before. My wife Cathy and I are helping get things organized for our local tri club (see the sidebar for a link). I reached out the middle of that week to a former member of the club who works for a sponsor of several local races. In the past our club has received discounts and free entries. In addition to our normal discounts, we received several free entries into their 5K that was the Saturday before the Marathon. Because it was a last minute thing, we decided to take two of the entries for ourselves and the plan was to have fun and just take it easy. My plan for the 5K was to get an idea for a pace I would want to run for the marathon. As my training has been consistent over the last few months, my pace at a Zone 2 HR has been gradually been getting faster. I decided to not go all out, but to put in a marathon effort for the first 1.5 miles. The first mile actually came in at 9:11. I haven't seen that kind of pace in quite some time. To top it off, it wasn't an all out 5K effort at all. I averaged about a 9:30 pace for the next 1/2 mile. Once I hit the water stop at mile 1.5, I decided to take it easy the rest of the way. I finished in 32:50 averaging just under 10:20. This gave me some though about what pace I should shoot for in the marathon. After Disney, my plan for A1A was finishing around 5:30 (12:36/mi). As it got closer to race day, I felt like a sub-5 hour marathon would be possible. I still feel like a 5:00 (11:27/mi) to 5:15 (12:01) marathon would have been possible had I not had the issues I had during the second half of the race. In the days leading up to the race, the analyst in me ran through numerous scenarios trying to find the ideal pace for both halves of the marathon in order to reach my goal. In the end, I decided to hang on to the 4:40 (10:41/mi) pacers for as long as possible (if it was not too fast/hard) and then attempt to hold off the 5:00 pacers as long as possible. My fear was that the second half of my race would drop off too far from the first half. As we took off, I was feeling great. I decided to initially only take short walk breaks at the water stations in order to keep up with the 4:40 pacer. I felt great holding on for the first 4 miles, averaging around 10:30. At about mile 4.5, I needed to make a pit stop, and we were running through a wooded park. Given the opportunity to make a pit stop without having to wait in line for a portajohn. Once I took care of business, I took back off. I knew I wouldnt be able to reconnect with the pacer, but I was ok with that. After leaving the pacers, I averaged 10:55 for the next 3 miles. After mile 8, my pace began to further slow down. I switched from quick walk breaks at the water stops to a 9 min run / 1 min walk plus walk the water stop plan. I wasn't feeling bad, but I could feel that sooner rather then later I would need to make a stop at a porta john. The other thing was that the half marathoners turned off at mile 8 and from there on, it was much more spread out among the runners and there was almost zero spectator support. I was able to hold off stopping until right after the half way point. I finished the first 13 miles in 2:27 (avg 11:19 per mi). While I was taking my potty break, the 5:00 pacer passed me, so I knew it was unlikely I would break 5 hours, but I was ok with that. My next goal was to beat 5:30, which was almost a minute per mile slower then I had run up to this point. I felt pretty comfortable that I could accomplish this. Unfortunately, my stomach did not agree. Things really went downhill around mile 15. My stomach began to bother me and I was forced to walk more then I would like. I had a hunch pretty quickly what was going on. In the past two weeks, we had made a big change in our diet and adopted a mostly paleo style diet. Because my sugar intake (beyond fruit) had drastically decreased, I am pretty sure my stomach essentially revolted from the amount of sugar I was taking in. I really hadn't had time to think through any changes to my race nutrition prior to this race and used what had worked in the past. Unfortunately I suspect this will not work in the future given my new way of eating. I have received several product recommendations, but hope to first try some natural solutions such as fruits and nuts. I hoped by backing off on all the gels, that my stomach would eventually give in and relax. Unfortunately this never happened. All I was concerned about at this point was finishing. I knew the 5:30 pacers would eventually pass me and it happened around mile 21. I was ok with this. I knew with around 4 miles to go, I could finish under 6 hours with almost no running. By mile 25 I was feeling a little better, I tried to pick it up and run as much as I could, but didnt have much left in my legs. I did at least average 13:53 for the last mile, even though I had to duck and dodge the little kiddos. For whatever reason, the race director decided to run the kids and parents one mile on the last mile of the race course while there was still 15 minutes left before the course cutoff. I was so upset with that. I crossed the finish line in 5:51:54 (13:20/mi). I had to hunt down my race medal only to find out that all they had were broken medals. WTF??? I was so upset. The volunteer did say to email the race director and they would send a new one out. I reached out to the RD this morning and so far I haven't heard back. Unfortunately the medals were poorly designed and the hinge easily breaks. There have been numerous reports on the race's Facebook page of the same issue. Overall, I have mixed feelings about this race. I seriously doubt I would do the marathon again and I am not sure if I would do the half. Overall, I can't complain too much. I finished my 2nd marathon in 5 weeks. This one was over an hour faster then Disney (though I can't entirely compare the two given that I was running/walking with my sick wife). I have a good idea of what I need to do with my nutrition, and I have four weeks to test this out as I am planning on running the Publix Georgia Marathon on March 17th so that I can achieve Marathon Maniac status. Depending on my recovery (and my continued weight loss), I may shoot for a specific time goal, or I may just enjoy the scenery and try to finish before the 6 hour cutoff This race will be much different then the first two as it is a fairly hilly course. This could actually be a good thing because it creates some variety in the stress on my legs. The only pacer in my range is 5:00 so if I want to hit a goal pace, it may be to stay with the 5:00 pacer. It sounds like you just went out too fast, Kevin. The run/walk protocol calls for starting that way in the beginning, so maybe if you had kept your heartrate down in that way, you might have been able to maintain it throughout for more even splits. Maybe you should try that in training for Publix?